Pokey over at Quilting Arts spoke of tiaras, so I decided to alter one for myself. If you stop by the Quilting Arts booth at the Chicago International Quilt Show this month, you may catch me wearing it! 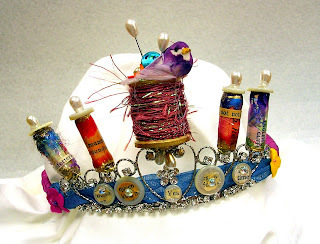 I had fun adding some things that are personal, like an old wooden spool, a little birdie, some of my favorite vintage buttons and handmade paper beads. Queen of stitch! Quite a lovely tiara. I love the spools of thread. Enjoy Festival in Chicago, it sounds like it will be a blast to be in Make It University. I have a tiara from 2003 that I wear when I work in Open Studios. This tiara lookt s much more awesome in person. It sparkles with warmth and good cheer! What fun! I used to need one of these. Time to get back to stitching again.